Abstract. Cold-water corals are important habitat formers in deep-water ecosystems and at high latitudes. Ocean acidification and the resulting change in aragonite saturation are expected to affect these habitats and impact coral growth. Counter to expectations, the deep water coral Lophelia pertusa has been found to be able to sustain growth even in undersaturated conditions. However, it is important to know whether such undersaturation modifies the skeleton and thus its ecosystem functioning. Here we used Synchrotron X-Ray Tomography and Raman spectroscopy to examine changes in skeleton morphology and fibre orientation. We combined the morphological assessment with boron isotope analysis to determine if changes in growth are related to changes in control of calcification pH. We compared the isotopic composition and structure formed in their natural environment to material grown in culture at lower pH conditions. Skeletal morphology is highly variable but shows no distinctive differences between natural and low pH conditions. 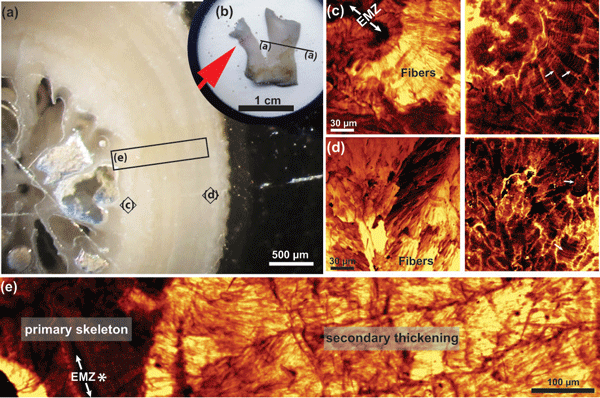 Raman investigations found no difference in macromorphological skeletal arrangement of early mineralization zones and secondary thickening between the treatments. The δ11B analyses show that L. pertusa up-regulates the internal calcifying fluid pH (pHcf) during calcification compared to ambient seawater pH and maintains a similar elevated pHcf at increased pCO2 conditions. We suggest that as long as the energy is available to sustain the up-regulation, i.e. individuals are well fed, there is no detrimental effect to the skeletal morphology. How to cite: Wall, M., Ragazzola, F., Foster, L. C., Form, A., and Schmidt, D. N.: pH up-regulation as a potential mechanism for the cold-water coral Lophelia pertusa to sustain growth in aragonite undersaturated conditions, Biogeosciences, 12, 6869-6880, https://doi.org/10.5194/bg-12-6869-2015, 2015. We investigated the ability of cold-water corals to deal with changes in ocean pH. 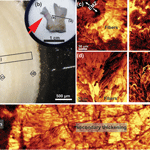 We uniquely combined morphological assessment with boron isotope analysis to determine if changes in growth are related to changes in control of calcification pH. We found that the cold-water coral Lophelia pertusa can maintain the skeletal morphology, growth patterns as well as internal calcification pH. This has important implications for their future occurrence and explains their cosmopolitan distribution.